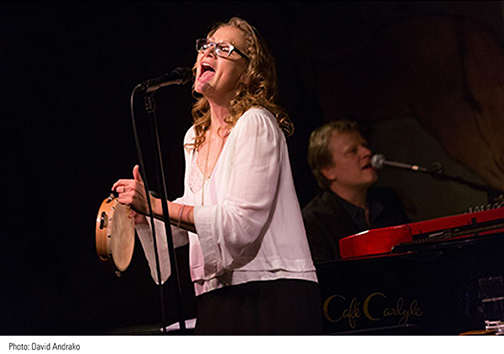 Joan Osborne's many fans expected her to sing her signature "One of Us" at the Café Carlyle this week, but instead she sang a specially designed show of Bob Dylan tunes, and had us all in a head bobbing sing-along. "Who knew the Carlyle could become a hootenanny," she quipped after telling tales of performing at Delta 88 and Mondo Cane on Bleecker Street. Bringing her downtown bluesy flair uptown, from "Highway 61," to "Tangled Up in Blue," to "You're Gonna Make Me Lonesome When You Go," some songs well rehearsed and some just winging it, the evening was a rediscovery of familiar Dylan, re-mined for new riches.